The extraordinary student mobilization in Quebec has already sustained the longest and largest student strike in the history of North America, and it has already organized the single biggest act of civil disobedience in Canadian history. It is now rapidly growing into one of the most powerful and inventive anti-austerity campaigns anywhere in the world. Every situation is different, of course, and Quebec's students draw on a distinctive history of social and political struggle, one rooted in the 1960s ‘Quiet Revolution’ and several subsequent and eye-opening campaigns for free or low-cost higher education. Support for the provincial government that opposes them, moreover, has been undermined in recent years by allegations of corruption and bribery. Nevertheless, those of us fighting against cuts and fees in other parts of the world have much to learn from the way the campaign has been organized and sustained. It's high time that education activists in the UK, in particular, started to pay the Quebecois the highest compliment: when in doubt, imitate! The first reason for the students' success lies in the clarity of both their immediate aim and its links to a broad range of closely associated aims. Students of all political persuasions support the current ‘minimal programme,’ to block the Liberal government's plan to increase tuition fees by 82 per cent over several years. Most students and their families also oppose the many similar measures introduced by federal and provincial governments in Canada in recent years, which collectively represent an unprecedented neoliberal attack on social welfare (new user fees for healthcare, elimination of public sector services and jobs, factory closures, wanton exploitation of natural resources, an increase in the retirement age, restrictions on trade unions and so on). And apart from bankers and some employers, most people across Canada already regret the fact that the average debt for university graduates is around $27,000. A growing number of students now also support the fundamental principle of free universal education, long defended by the more militant student groups (loosely co-ordinated in the remarkable new coalition CLASSE), and back their calls for the unconditional abolition of tuition fees, to be phased out over several years and compensated by a modest and perfectly feasible bank tax, at a time of record bank profits. “This hardline stance,” the Guardian's reporter observed, “has catapulted CLASSE from being a relatively unknown organization with 40,000 members to a sprawling phenomenon that now numbers 100,000 and claims to represent 70 per cent of striking students.” Growing numbers, too, can see how such a demand might help to compensate for the most obvious socioeconomic development in Canada over the last 30 years: the dramatic growth in income inequality, reinforced by a whole series of measures (tax cuts, trade agreements, marketization plans...) that have profited the rich and very rich at the expense of everyone else. In Quebec, student resistance to these measures hasn't simply generated a contingent ‘chain of equivalences’ across otherwise disparate demands: it has helped to create a practical, militant community of interest in the face of systematic neoliberal assault. “It's more than a student strike,” a CLASSE spokesman said in April, “We want it to become a struggle of the people.” At first scornfully dismissed in the corporate media, this general effort to make the student movement into a social movement has borne fruit in recent weeks, and it would be hard to describe the general tone of reports from the nightly protest marches that are now taking over much of Montreal in terms other than collective euphoria. Nothing similar has yet happened in the UK, of course, even though the British variant of the same neoliberal assault – elimination of the EMA, immediate trebling of fees, systematic marketization of provision – has been far more brutal. But the main reasons for this lie less in some uniquely francophone propensity to defend a particular social heritage than in the three basic (and eminently transposable) elements of any successful popular campaign: strategy, organization and empowerment. As many students knew well before they launched their anti-fees campaign last summer, the best way to win this kind of fight is to implement a strategy that no amount of state coercion can overcome – a general, inclusive and ‘unlimited’ boycott of classes. One-day actions and symbolic protest marches may help build momentum, but only “an open-ended general strike gives students maximum leverage to make their demands heard,” the CLASSE's newspaper Ultimatum explains. So far, it has been 108 days and counting, and “on ne lâche pas” (we're not backing down) has become a familiar slogan across the province. So long as enough students are prepared to sustain it, their strike puts them in an almost invincible bargaining position. Ensuring such preparation is the key to CLASSE as an organization. It has provided new ways for students previously represented by more cautious and conventional student associations to align themselves with the more militant ASSÉ, with its tradition of direct action and participatory democracy. Activists spent months preparing the ground for the strike, talking to students one at a time, organizing department by department and then faculty by faculty, starting with the more receptive programmes and radiating slowly out to the more sceptical. At every pertinent level they have created general assemblies, which have invested themselves with the power to deliberate and then make, quickly and collectively, important decisions. Actions are decided by a public show of hands, rather than by an atomising expression of private opinion. The more powerful and effective these assemblies have become, the more active and enthusiastic the level of participation. Delegates from the assemblies then participate in wider congresses and, in the absence of any formal leadership or bureaucracy, the “general will” that has emerged from these congresses is so clear that CLASSE is now the main organizing force in the campaign and able to put firm pressure on the other more compromise-prone student unions. The main result of this process so far has been one of far-reaching collective empowerment. Resolved from the beginning to win over rather than follow the more sceptical sectors of the media and ‘public opinion,’ the students have made themselves more powerful than their opponents. 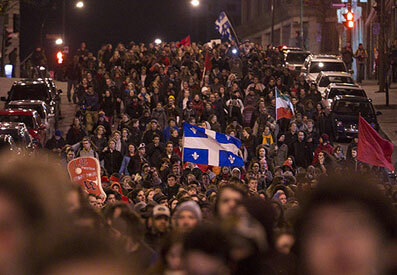 “[We] have learned collectively,” CLASSE spokesperson Gabriel Nadeau-Dubois said last week, “that if we mobilize and try to block something, it's possible to do it.” From rallies and class boycotts, in April the strike expanded to include more confrontational demonstrations and disruptive nightly marches through the centre of town. Soon afterwards, solidarity protests by groups like Mères en colère et solidaires started up in working-class districts of Montreal. In a desperate effort to regain the initiative by representing the conflict as a criminal rather than political issue, the panicked provincial government rushed through its draconian Bill 78 to restrict the marches, discourage strike enforcement and consolidate its credentials (in advance of imminent elections) as a law-and-order administration. In the resulting escalation, however, it's the government that has been forced to blink. On 23 May, the day after an historic 300,000 people marched through Montreal in support of the students, police kettled and then arrested more than 700 people – a jaw-dropping number by historical standards. But the mobilization has become too strong to contain, and after near-universal condemnation of the new law it is already unenforceable. Since 22 May, pro-student demonstrations have multiplied in ways and numbers the police can't control, and drawing on Latin-American (and older charivari) traditions, pot-clanging marches have mushroomed throughout the province of Quebec. On Thursday night tense negotiations with the government again broke off without resolution, and business and tourist sectors are already alarmed by the prospect of a new wave of street protests continuing into Montreal's popular summer festival season. There is now a very real chance that similar mobilizations may spread further afield. Recent polls suggest that most students across Canada would support a strike against tuition increases, and momentum for more forceful action may be building in Ottawa and across Ontario; in Quebec itself they also show that an initially hesitant public is beginning to swing behind the student demands and against government repression. On 30 May, at the ritual hour of 8pm, there were scores of solidarity rallies all over Canada and the world. In London around 150 casserolistas clanged their way from Canada House to the Canadian embassy at Grosvenor Square. If enough of us are willing to learn a few things from our friends in places like Quebec and Chile, then in the coming years such numbers may change beyond all recognition. After much hesitation the NUS recently resolved that education should be “free at all and any level,” and activists are gearing up for a massive TUC demonstration on 20 October. After a couple of memorable springs, it's time to prepare for a momentous autumn.